Referred otalgia is a topic unto itself. Although many entities can cause referred otalgia, their relationship to ear pain must be identified. A categorical discussion of the workup, treatment, prognosis, demographics, and other issues is impossible because the various pathologies responsible for creating referred otalgia are so diverse. Reports document that not all otalgia originates from the ear. Many remote anatomic sites share dual innervation with the ear, and noxious stimuli to these areas may be perceived as otogenic pain. By definition, referred otalgia is the sensation of ear pain originating from a source outside the ear. To better understand referred otalgia, the physician first must understand the anatomic distribution of nerves associated with the ear. Irritation of these nerves, as well as irritation of distant branches of these nerves, can cause the perception of pain within the ear. The picture below demonstrates the diversity of pathologies that can be the source of referred otalgia. This picture demonstrates the diversity of pathologies that can be the source of referred otalgia. Frequently, the workup suggests that otalgia may be a problem of dental origin. A complete blood count may indicate an occult infection. Thyroid function and erythrocyte sedimentation rate (ESR) studies may reveal thyroiditis and temporal arteritis. The perception of aural fullness may be described as ear pain and is observed in conditions associated with endolymphatic hydrops and eustachian tube dysfunction. Ménière disease can be diagnosed by history, audiometrics, and a battery of laboratory tests. In the absence of obvious fluid within the middle ear, aural fullness secondary to eustachian tube dysfunction may manifest with a practically imperceptible bulging or retraction of the tympanic membrane. If autoinsufflation is not effective in relieving this pressure, consider a diagnostic myringotomy. When the history and physical examination findings are inconclusive, use of local anesthesia may help localize the problem. Identification of a causative etiology is often necessary to successfully treat referred otalgia. Once determined, most causes of referred otalgia can be readily treated. Use antibiotics in treating various types of infections (eg, tonsillitis, pharyngitis, sinusitis). Use antivirals if the causative agent is suspected to be viral, such as in cases associated with herpes zoster or shingles. Antifungals are indicated if the source is caused by a fungus (eg, oral thrush/candidiasis). Antiulcer/antacid medications can be used for esophagitis and gastroesophageal reflux disease. Use nonsteroidal anti-inflammatory drugs (NSAIDs) when myalgias and neuralgias are suspected. Reexamine the patient after a 2-week trial of NSAIDs. Strong narcotic analgesics are not indicated and should not be used to treat referred otalgia. Narcotics may mask symptoms, making the correct diagnosis difficult to reach. The sensory innervation of the ear is served by the auriculotemporal branch of the fifth cranial nerve (CN V), the first and second cervical nerves, the Jacobson branch of the glossopharyngeal nerve, the Arnold branch of the vagus nerve, and the Ramsey Hunt branch of the facial nerve. Neuroanatomically, the sensation of otalgia is thought to center in the spinal tract nucleus of CN V. Not surprisingly, fibers from CNs V, VII, IX, and X and cervical nerves 1, 2, and 3 have been found to enter this spinal tract nucleus caudally near the medulla. Hence, noxious stimulation of any branch of the aforementioned nerves may be interpreted as otalgia. Harrison E, Cronin M. Otalgia. Aust Fam Physician. 2016 Jul. 45 (7):493-7. [Medline]. [Full Text]. Kozin ED, Sethi RK, Remenschneider AK, et al. Epidemiology of otologic diagnoses in United States emergency departments. Laryngoscope. 2015 Aug. 125 (8):1926-33. [Medline]. Kim SH, Kim TH, Byun JY, Park MS, Yeo SG. Clinical Differences in Types of Otalgia. J Audiol Otol. 2015 Apr. 19 (1):34-8. [Medline]. Adour KK. Acute temporomandibular joint pain-dysfunction syndrome: neuro-otologic and electromyographic study. Am J Otolaryngol. 1981 May. 2(2):114-22. [Medline]. Mejersjo C, Naslund I. Aural symptoms in patients referred for temporomandibular pain/dysfunction. Swed Dent J. 2016. 40 (1):13-20. [Medline]. Magalhaes BG, Freitas JLM, Barbosa ACDS, et al. 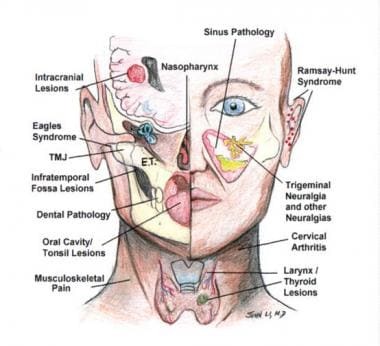 Temporomandibular disorder: otologic implications and its relationship to sleep bruxism. Braz J Otorhinolaryngol. 2017 Aug 23. [Medline]. [Full Text]. Kim SH. A Case of Bruxism-Induced Otalgia. J Audiol Otol. 2016 Sep. 20 (2):123-6. [Medline]. [Full Text]. Al-Sheikhli AR. Pain in the ear--with special reference to referred pain. J Laryngol Otol. 1980 Dec. 94(12):1433-40. [Medline]. Frankel VH. Whiplash injuries to the neck. Hirsch C, Zotterman Y, eds. Cervical Pain. New York, NY: Pergamon Press; 1971. Pinheiro TG, Soares VY, Ferreira DB, Raymundo IT, Nascimento LA, Oliveira CA. Eagle's Syndrome. Int Arch Otorhinolaryngol. 2013 Jul. 17 (3):347-50. [Medline]. Roberts DS, Yamasaki A, Sedaghat AR, Lee DJ, Reardon E. Tympanic Plexus Neurectomy for Intractable Otalgia. Laryngoscope Investig Otolaryngol. 2016 Oct. 1 (5):135-139. [Medline]. [Full Text].